On this week’s The Flash Podcast, Andy, Amy and returning guest-host Jason Inman (host of DC All Access and Geek History Lesson) get together to review 2.16 of The Flash titled “Trajectory” that introduces the DC Comics character Eliza Harmon a.k.a. Trajectory as she becomes the show’s first female speedster, but an enemy of Barry Allen. In addition to that, they discuss the new promos and photos that have been coming out for the upcoming crossover with Supergirl that is happening next week! 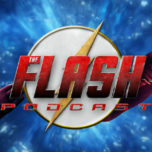 The trio also read listener feedback and e-mails about “Trajectory” before getting to the preview session for next week’s episode titled “Flash Back”. That and more on the latest episode of The Flash Podcast! -You can follow Jason all over social media on Facebook, Twitter, Instagram and subscribe to his YouTube channel. -Subscribe to DC All Access, which Jason hosts with Tiffany Smith, on YouTube with new episodes coming out every Tuesday with exclusives on the world of DC Comics! -Also make sure to check out Jason’s comic book podcast Geek History Lesson, co-hosted by Ashley Robinson (good friend of The Flash Podcast!) which you can subscribe to on iTunes and Stitcher Radio!